View our location on Google maps or the University of Cambridge online map. 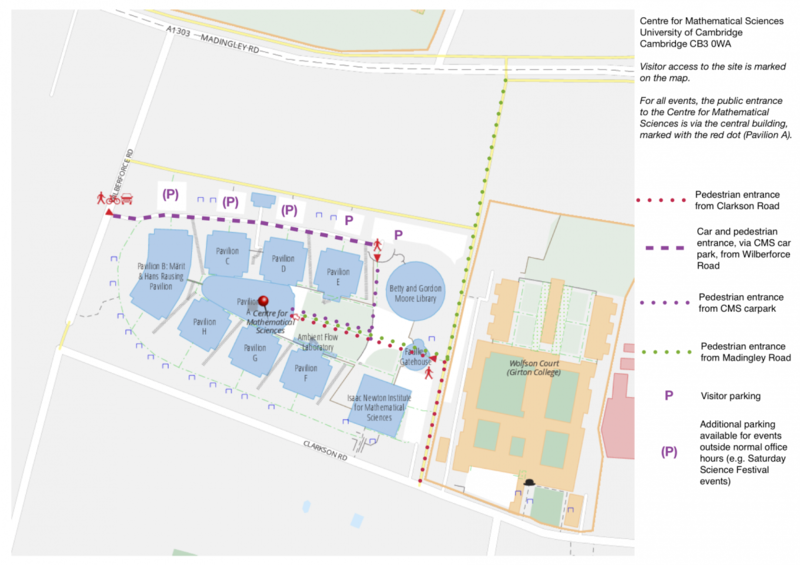 See a site plan for the Centre for Mathematical Sciences below, or download as a pdf. The bus station is 1½ miles from the Centre for Mathematical Sciences (CMS) and the railway station about 2½ miles. The CMS is easily accessible from Cambridge Railway Station and also Madingley Road Park and Ride site using the Whippet Bus Service Universal U, which stops at Grange Road bus stop only 5 minutes away from the CMS. For current information on the Whippet Bus service check the Whippet Bus Website. There is also a taxi rank at Cambridge station. PLEASE NOTE there is very limited visitor parking at the Centre for Mathematical Sciences, which must be booked in advance. Unless otherwise advised, on-site parking is not usually available for conferences and other events (unless you need on-site parking due to a disability in which case please ring the CMS Reception on 01223 765000 in advance and they will be happy to help). Please note that the CMS car park is not suitable for coaches. There is free 1-hour limit (from 8am to 5pm) street parking on Clarkson Road and unrestricted street parking on Wilberforce Road (we suggest the end accessible via Clarkson Road as this is usually less busy). However if you arrive after 9am it will be difficult to find a space. There are numerous cycle racks around the CMS site. Download a site plan of the CMS showing visitor access. The main entrance to the Centre for Mathematical Sciences is via the pedestrian path (signed) next to the Isaac Newton Institute car-park on Clarkson Road, and then through the gatehouse. The CMS site consists of a number of buildings – go to the central building with the low, curved roof and the glass front (directly in front of you as you come through the gatehouse) which is where the Reception desk is located. There are signs showing the route to the main entrance around the site and from the CMS car park. The telephone number for CMS Reception, staffed during normal office hours and in University term time on Saturday mornings, is 01223 765000.